This book offers a history of sociological theory from a Christian perspective, tracing the origins of sociology from the beginnings of Western science as introduced by the Scholastics of the twelfth century, which, when combined with their emphasis on rationality, led to the Enlightenment "science of man"—an emphasis that eventually resulted in sociology, which combined empiricism and a Christian moral philosophy. 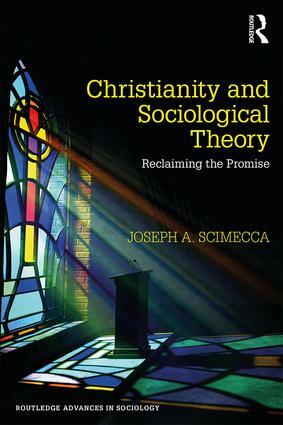 With chapters focusing on the Scholastics, the Enlightenment, the rise of sociology in France, Germany, and the United States, and the legacy of Positivism, Christianity and Sociological Theory shows how the emphasis on moral philosophy was eventually lost as sociology rejected Christian underpinnings, resulting in what can only be described as an extremely limited sociology. A rigorous exploration of the trajectory of the discipline from its Christian origins, this volume reveals the potential that exists for sociology in an era of postmodern thought to reclaim its promise through a re-introduction of Christianity. Joseph A. Scimecca is Professor of Sociology at George Mason University, USA. He is the author of Society and Freedom: An Introduction to Humanist Sociology, Education and Society and The Sociological Theory of C. Wright Mills, the co-author of Crisis at St. John's: Strike and Revolution on The Catholic Campus, Classical Sociological Theory: Rediscovering the Promise of Sociology and Sociology: Analysis and Application, and the co-editor of Conflict Resolution: Cross Cultural Perspectives.